040Hosting Review 2019: Is 040Hosting a Good Hosting? 040Hosting offers dependable services for standard and SSD website hosting with unlimited domains, subdomains, and robust bandwidth. Stick with standard or SSD shared hosting as their optimized CMS hosting plans are overpriced. 040Hosting has been offering website hosting services since 1996 to customers all around the world. They offer hosting in four continents with plans for shared hosting, elastic website hosting, and dedicated server hosting. They offer standard and SSD shared hosting plans with robust features and proactive security measures. While their customer support is a bit lacking, their services are more than adequate to handle most websites. However, you’ll want to stay away from their optimized CMS hosting packages, as they are very pricey. Imunify 360 offers well-rounded protection for your website including firewall protection, malware detection, and more. 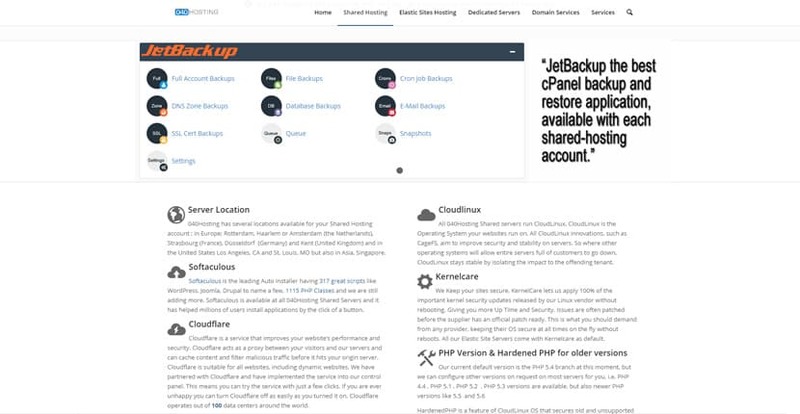 JetBackup is a robust backup and restore tool that allows for daily, weekly, and monthly backups. You can even get hourly backups for a fee. One thing that stands out is that they don’t offer support for Python or Ruby, which would be great for advanced webmasters, but not a dealbreaker for most. They don’t provide a website builder for beginners, but they do offer the Softaculous auto-installer which will allow you to install hundreds of web apps, including WordPress, Drupal, PrestaShop and more. Experienced webmasters will have no problems with this service as cPanel access is standard. The Bronze and SSD Starter plans are a bit lacking in space, especially if you plan to host multiple domains. The Blue and SSD Plan #2 are the most popular and well-designed starter options. 040Hosting’s pricing is competitive, but note that billing terms vary based on plans. The Bronze and SSD Starter offer annual billing only. Their Red and SSD Plan #1 offer quarterly and annual billing, while the other plans offer monthly, quarterly, and annual billing. If you’re looking for an optimized solution for WordPress or Joomla, 040Hosting offers both. However, you’ll pay significantly more for optimized hosting, with certain plans charging as much as ten times what you’d pay for their standard plans. 040Hosting’s support is unimpressive, offering only ticket support and a searchable knowledge base. They do provide a server uptime page so you can track the overall uptime of your web server. Live chat and phone support are sorely needed. If you’re looking for solid website hosting for your personal or business website, 040Hosting is a great choice. With strong security, ample bandwidth, and excellent value-added features, their services are worth checking out. However, stay away from their pricey optimized CMS hosting. Wondering how 040Hosting stacks up against other Web Hosting companies? Enter any other Web Hosting company and we will give you a side-by-side comparison.